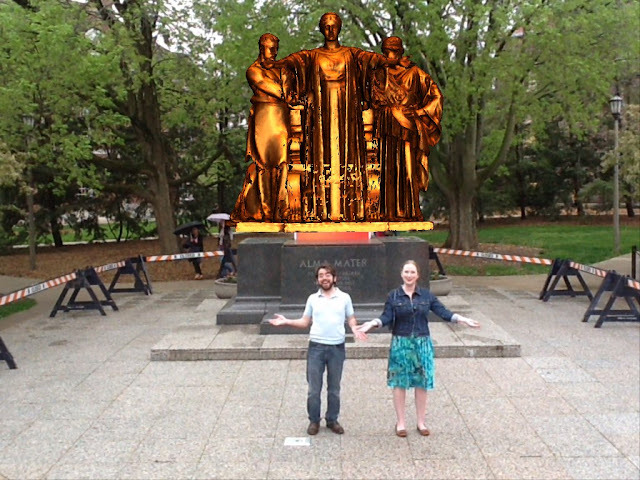 The author and his wife in front of the augmented reality Alma Mater statue at UIUC. Some of the digital statue's production was led by community fab lab organizers, which has been instrumental in producing "bits-to-atoms" outreach. When the University of Illinois at Urbana Champaign needed to remove its 13-foot, 10,000 pound statute in August, 2012, due to a botched waterproofing treatment, the administration was under the impression that the statute would be back in time for the 2013 commencement. As these things sometimes go, the effort is taking longer than expected, and is costing much more money. The previous effort at waterproofing the statute had trapped moisture inside the statute and caused much more damage. The budget has swelled from $100,000 to $360,000, with the Alma Mater now scheduled to return to its granite plinth sometime in the 2013-2014 academic year. Posing in front of the Alma for pictures has been a longtime tradition of UIUC newly-grads. A multi-department collaboration brought back the statute in the nick of time for graduation, which drew expertise and equipment from the Beckman Institute for Advanced Science and Technology, the National Center for Supercomputing Applications (NCSA), the Institute for Computing in Humanities, Arts and Social Science (I-CHASS). Instrumental to the restoration effort were two members from the Champaign-Urbana Community Fab Lab (CUCFL), Robert McGrath and Andrew Knight. McGrath, a retired computer scientist from NCSA, provided software integration, while Knight fabbed up a custom computer mounting solution. More on their lab in a minute. The "perfect" small unmanned aircraft, commonly called a drone, might still be several generations away. But like Moore's law, those generational cycles are getting shorter and shorter. Chris Anderson of 3DRobotics suspects we're closing in on the drone equivalent of the Mac: a relatively affordable, accessible, and most importantly, practical piece of technology that can be deployed every day. Tremendous headway has been made with multirotor technology (the heicopters, quadrotors, hexcopters, octocopters, and what have you). The market is quickly becoming flush with a variety of these aircraft, to the point where several options are available for each price bracket. There's everything from $300 hobbyist rigs from big-name RC and electronics manufacturers, to $1,000 semipro setups from DJI and 3DRobotics, to $10,000 rigs that can loft, pan and tilt a DSLR or DV camera. The differences between each step may be as simple as stronger frames, larger motors and higher-capacity batteries. A drone of your very own, from novice to pro. Sometimes no assembly required. For the time being, however, it's still useful to have the technical know-how to put one together. It's even more useful to know how to fabricate a drone, or fabricate parts to suit your specific application. 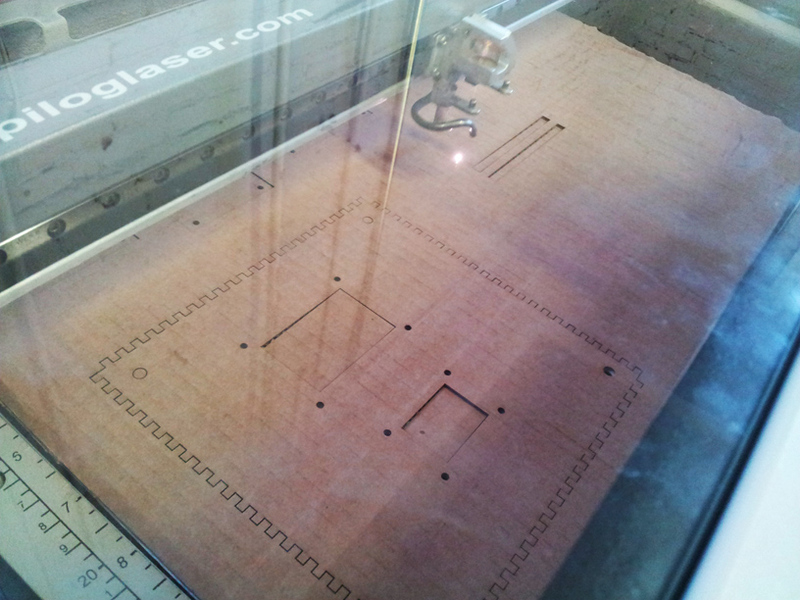 Making a home for a sensor node - with a laser. Sensor nodes need a good home if they're to last any considerable amount of time. And if they're to be deployed outdoors, they need an especially robust home. This can be complicated. Most sensors need to be exposed to the elements to obtain good readings. But expose these electronics to the elements too much, and you'll break them. In a pursuit of finding the right balance between price and accuracy for a sensor node for professional and community journalists, I'm fabricating a prototype using open-source hardware and software, 3D printers, and now, lasers. Fortunately the "maker" revolution makes this process more accessible than ever. Previously I wrote about working with Arduinos and temperature sensors. Continuing on the theme of sensor nodes for journalism, here are some details on the next step in the prototyping process.